Yunus Erlangga, artist name Joen Yunus, is the second cartoonist from Indonesia to join Cartoon Movement. He has been a professional cartoonist and caricaturist since 1992, and has received multiple awards. To see more of his work, visit his blog Natural Born Cartoonist. Over 90% of maternal deaths occur in developing countries. This week's shirt design, based on a cartoon by US cartoonist Dan Carino, focuses on that issue, but Spreadshirt Europe flagged the design as unethical. As UN inspectors are heading to the site of the suspected chemical weapons attack in Syria, our cartoonists visually condemn all the death and suffering that is the result of this conflict. Check out cartoons on the chemical attack here, and our entire cartoon collection on the conflict in Syria here. This week's shirt design reflects the grim news from Egypt. Although the situation is complex, but one thing is very clear: people are dying. Image by Sudanese artist Talal Nayer. When we started building our cartoonists community in 2008, we expected to have cartoonists from India join fairly soon. The Indian political cartooning scene is thriving, with lost of publications featuring cartoons, and thus, lost of cartoonists. But for some reason, it has taken five years to get the first Indian cartoonist on board. So we're very pleased to welcome Sajith Kumar, a 32- year old editorial cartoonist based in New Delhi, working for the Financial Chronicle, a business daily. Censorship in Venezuela, or Not? We all know censorship exists. But it is more difficult to determine to what extent censorship exists in any given country. Political cartoonists often operate at the borders of what is allowed to be published, and they are probably the best gauges we have when it comes to measuring press freedom. But what if cartoonists themselves do not a agree that there actually is censorship, or do not agree with each other about the level of censorship that exists? In February of this year, we interviewed three Cuban cartoonists about working in Cuba. Surprisingly, they did not feel they were heavily censored in their work. This is surprising, because Cuba is ranked 171 (out of 179 countries) in the Free Press Index 2013. This month, we noticed Emilio Agra commenting on an interview with Rayma Suprani in the webdoc 'No Laughing Matter'. Rayma Suprani is also a Venezuelan cartoonist, and in her experience, there is much censorship in Venezuela. She is very critical of the Venezuelan government, and has been threatened and intimidated because of her work. To hear her side of the story, watch this interview in the webdoc, and read this interview from 2012 at Sampsonia Way. According to Emilio, Ramya's claims about the Venezuelan media are untrue, and her fear of oppression is exaggerated. Intrigued by his perspective, we talked to Emilio to find out more. Before going into the issue of censorship, he is keen to explain his stance on Venezuelan politics. Although he has a favorable attitude to the policies of the Chavez-government (and now, since the death of Chavez, lead by Nicolás Maduro), he says he is not blind to the many shortcomings of those in power. But for the most part, he is very critical of the United States and their interest in the wealth of resources that Venezuela has to offer. In his view, the portrayal to the outside world of Venezuela as unfree and dictatorial might well be a strategy of the US using the international media to regain the influence they lost with Chavez's rise to power. Is there censorship in Venezuela? No, there is no censorship in Venezuela. Neither Rayma nor any cartoonist or reporter can say that did not publish anything for censorship. Even absurd and false news is published, and nothing happens. A cartoonist from one of the best known newspapers of the country made a cartoon that openly called to kill the president. This cartoonist still publishes today. In your comment you mention that Venezuela has 120 newspapers (10 of which are state -owned or pro-government), of which 7 have national coverage. How many of these are state-owned or pro-government? 'The national newspapers are 'Ultimas Noticias' (currently the largest circulation), 'El Nacional', '2001', 'El Universal', 'El Mundo', 'Meridiano' (sports), 'Tal Cual', El Nuevo País'. These are all private. Government property are 'El Correo del Orinoco', 'Ciudad CCS' (only in Caracas) and 'Ciudad Petare' (only in part of eastern Caracas) and pro-government is the newspaper 'Vea'. Venezuela is placed 117th (out 179 countries) on the press freedom index of 2013. How do you explain that? 'I cannot explain it. We should know who makes that list and on what basis; if they are guided by the headlines and not by facts, it is logical that they are so poorly informed. Ramya Suprani received threats because of her work, and Amnesty International called on the Venezuelan government to launch an impartial and thorough investigation. Why do you think Amnesty International felt the need to call for attention? 'If we talk of threats and insults, I might do a show with Twitter and threatening emails I received. The situation of political polarization in the country (which is much to blame to malicious media), leads to many 'exalted' and fanatical posturing on both sides, and threats which are no more than that. In my case I have not made noise with the threats I received. Friday March 22, 2013 24:25 Caracas. - The cartoonist for El Universal, Rayma Suprani, went to the Attorney General's Office to report that has been the victim of threats and insults again, this time through anonymous messages on her cell phone and social networks. The journalist and cartoonist took the opportunity to call the NGOs and the National College of Journalists (CNP) to issue statements warning and urge the state to the practice of journalism is respected. "Journalism has to get ahead in these times and defend with the criticism, self-criticism and try to understand that this is not a given profession for brave is an exercise like any other and we are intimidating," she added. Are Venezuelan journalists regularly in danger for criticizing the government? Do you have trust in the government to protect/support writers, cartoonists etc. who are threatened because they criticize the regime? 'The word 'regime' is always used to negatively qualify a government. It is used with de facto governments (governments that may have seized power illegally), but in Venezuela sixteen elections were held in fourteen years, so the word 'regime' should not be used. Nobody calls the Obama administration a 'regime', in spite of having won the elections with a very narrow margin and acting worse than de facto regimes. All images by Emilio Agra. For the last week, our newsroom has been flooding with cartoons about the events in Egypt. The issue has sparked a battle of opinions, with some clear fault lines. In this post, we identify the major divisions by looking at the cartoons that have been sent to us. ther cartoonists blame the US for continuing to back the military. Cartoons by Jehad Awrtani and Gianfranco Uber. 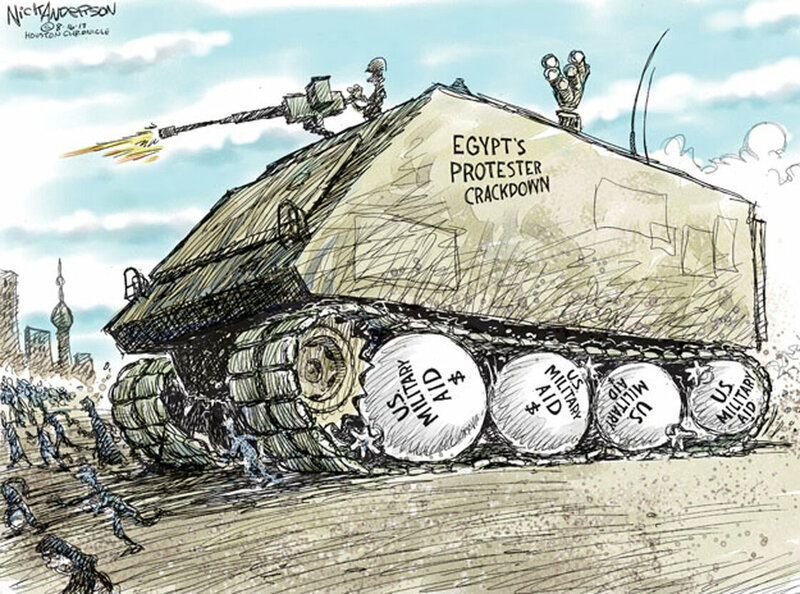 Someone commented on a Egypt-cartoon on our Facebook page: '[This is] a solemn reminder that editorial cartoons, like any other media, can be skewed to benefit a particular political belief.' At Cartoon Movement, we believe that cartoons are by their very nature opinions. We also think that if you see enough opinions on any given issue, you get a well-rounded view. But in the case of Egypt, the cartoons do not contribute to a greater clarity; instead they reflect the reality: confusing, muddled, complex and uncertain. What is special about this partnership is that it will be the first cooperation, that we know of, between a photo agency and cartoon syndicate (although we're more than just a syndicate). Traditionally, photographs and cartoons have had separate markets, but we think it makes perfect sense to combine the strengths of high quality news photography with the power of editorial cartoons. We have added a new design to our t-shirt webshop. There is a disturbing link between psychopathy and leadership: 'The hallmarks of the psychopathic personality involve egocentric, grandiose behavior, completely lacking empathy and conscience.' Image by Iranian artist Shahrokh Heidari.